Hello again everyone, and welcome to this week’s installment of Channel Chaser! I’ve got another review for you today, this one coming to you once again hot off the presses of BBC Television–or it would be, if it hadn’t been cancelled as of 2009. But no matter: let’s get right to it and dive into the wild world of Robin Hood. 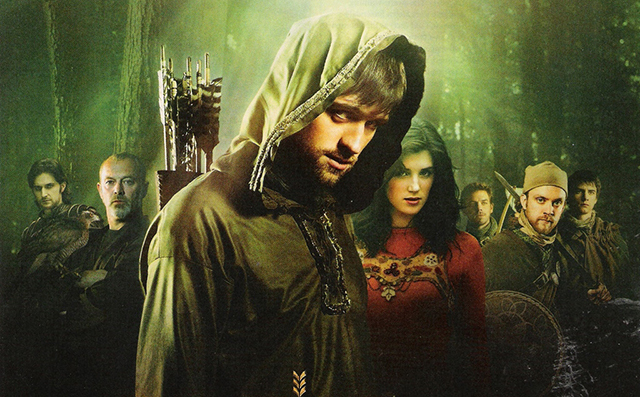 Robin Hood, which premiered in 2006 to embark on a relatively short three-year run, takes place as the titular lord, Robin of Locksley, returns to England after an extended absence in the Holy Land. He and his servant Much discover that Nottingham is not at all like they remember it; it is now ruled by the iron fist of Vaisey, the new Sheriff, along with his deputy, Guy of Gisborne, who has seized Robin’s lands. Robin is quickly made an outlaw for speaking out against the Sheriff’s plans, but over the course of a few episodes he pulls a band of other outcasts together in Sherwood Forest who fight with him to restore law and justice. Another element of the series is Robin’s relationship with Lady Marian, who he was engaged to at one point before leaving for the Crusades. On his return, Robin is pleased to find that she is still unmarried, though bad blood between them prevents any kind of immediate romantic connection. Marian is also promised to Guy of Gisborne, forming a complicated love triangle that creates many of the problems the outlaws face. Admittedly, Robin Hood isn’t exactly blazing new trails in terms of storytelling because there have been countless other shows and movies made about the famous outlaw over the years. So what makes this version stand out? The main thing would probably have to be the depth of characterization involved in the show, and the fact that almost all of them prove to be surprisingly dynamic. Topping this curve is Robin himself, played by Jonas Armstrong, who despite his usually cheeky and brash nature has a surprisingly intense emotional arc, showcasing his post-traumatic stress from the Crusades, his deep feelings for Marian, and the various events during the series that transform him into a much darker and vengeful man. Almost the other side characters, including the outlaws Will Scarlett, Allan A Dale, Little John, and Brother Tuck, just to name a few, have at least one episode where their background is explored in depth and more dimension is given to their personalities: something many other similar shows fail to do. My only complaint in this department is that Much is somewhat forgotten about over the course of the series, and despite his claims to be Robin’s best friend, their relationship is downplayed most of the time. Despite her leading role in the story, Marian too sometimes comes off as a bit bland and one-dimensional: not nearly to the same extent as Much, but some of the things that she does make me so angry that I want to throw things at my television. Let’s just say that if I was Guy of Gisborne, and she manipulated me as many times as she does to him during the series, I’d probably become a villain, too. Speaking of which, it is the bad guys in Robin Hood who really steal the show. While the Sheriff, portrayed brilliantly by Keith Allen, can at times be a bit camp and over the top, his sarcastic sense of humor and massive personality make him an absolute joy to watch. Part of this appeal is because no matter how many defeats he suffers, you just can’t keep him down, as he disappears, assumed to be dead, and reappears during the show’s run with surprising regularity. The Sheriff is a survivor, and his villainous antics are always a riot. The Sheriff’s enforcer Guy of Gisborne, played by Captain America and The Hobbit veteran Richard Armitage, creates a nice parallel to him by being just as reserved and brooding as the Sheriff is maniacal and bombastic. While Gisborne is shown to be ruthless and cruel at times, it is also clear that he has some redeeming qualities as he disapproves of many of the Sheriff’s more sadistic plans and is greatly attached to Marian. His character arc is probably the biggest of any person on the show, leading him from being a villain, to an anti-hero, and finally to a good guy in the final episodes. Additionally, his antagonistic relationship with Robin is always sure to raise the stakes. Robin Hood is also notable in that it is not afraid to blaze its own trail and go “off-book,” so to speak. Some of the many notable departures from standard Robin Hood fare involve a quest to the Holy Land, the inclusion of a Turkish former slave girl as part of Robin Hood’s merry band, Robin’s use of Middle-Eastern weaponry in place of traditional English weapons, Friar Tuck portrayed as an African man, and the death–that’s right, the DEATH–of Marian in the second season. While I wouldn’t say that all of these departures are well advised, they certainly do lend a bit of surprise and originality to the series. One thing that I must say really bothers me about Robin Hood, though, is that the show’s emphasis on fun and adventure leaves little in the way of historical accuracy. The characters frequently speak with modern turns of phrase that wouldn’t have made any sense in the Middle Ages. In addition, technical and factual errors are often present, such as plastic parts on Robin’s arrows, contemporary fashion accessories like cargo shorts, combat boots, and berets, and the mislabeling of Robin’s actually Mongolian bow and sword as Middle Eastern in origin. Sure, Robin Hood isn’t perfect from a technical standpoint, and the liberties it takes with traditional literature and history can be a little cheesy at times. But if you can get past these things, the bottom line is that this is a show that wants to be fresh and fun, and mostly succeeds at it. The great cast and strong storytelling combine to make a show that, at the very least, will keep you entertained for as long as you choose to watch it. Now that’s what I call hitting the mark. TV Stereotypes: How Much Is Too Much? Disney and Star Wars: “Forcing” the Issue?